In order to enhance reliability and safety, wireless temperature transmitters and wireless pressure transmitters were installed to monitor temperature and pressure measuring points in a large refinery. These replaced the existing offline pressure and temperature gauges which required a manual reading process. The wireless technology used for this project is based on ISA100.11a Standard – the Wireless Technology for Process Automation that was ratified in 2009 by the ISA100 Wireless Systems for Automation standardization group. This group is one of the subdivisions under the International Society of Automation (ISA) organization. Traditionally, many refinery plants are still manually collecting or reading data from different measuring points spread all over the refinery plant in order to monitor and maintain plant operation. This is due to the high cost of installation of wired instrument networks that has not been economically feasible in the past. This article describes a real world example with a large chemical refinery. The refinery covers a huge area, cabling between each wired transmitter is approximately 300 meters. Wiring the entire refinery in order to monitor the measuring points which spread around the refinery is not economically affordable. Therefore, many of the pressure and temperature measurements are off-line today. It requires a human patrol to physically visit the refinery plant everyday and manually read the pressure measurements from traditional pressure gauge and the temperature measurements from traditional temperature gauge, then report the reading to the control center by phone. After which, the operator will input the reported data into the system. This manual reading, reporting, and entering process is necessary in order to monitor the day-to-day operation of the refinery. The refinery searched for a way to automate this process with a goal to eliminate human errors in reading and recording each measurement, enhance operation in real-time remote monitory and improve the overall safety. The plant manager looked for a cost effective and reliable network solution which not only could realize the online continuous reading of the pressure and temperature measurements, but also able to expend its networking capability in the future for more measuring points and other measuring valuables. Reliability. This needs to be able to provide a better than reasonable security, and have robust methods for wireless communication, and redundancy. Scalability. One single network infrastructure with a common network management and security management function., The network supports from a few ten's to a ten thousand's of sensors in the field; is capable to support short and long radio ranges, can co-existence with other wireless technologies within the same frequency band, effectively transports small sensor data as along with large data throughput (such as waveforms or firmware updates). Openness. Interoperability is well defined in its communication interface thus allowing users to pick the best-in-class product in the market; a global usability and leverage existing well approved communication models and protocols such as IPv6, UDP, and 6LowPAN, etc. Easy deployment. This allows easy installation, single management function, simple maintenance, and power management; support for Over-the-Air provisioning for easy firmware upgrade for maintenance and operation. Multi-function. Multiple application protocols within a single wireless infrastructure such as HART, Foundation Fieldbus, Profibus, Modbus are supported, allowing easy integration with legacy systems. Also, it is able to support restricted latency and flexible timeslot to accommodate different application requirements, design to handle from class 1 for monitoring to class 5 for close loop-control. The ISA100.11a wireless standard for Process Automation is designed to address the entire requirements list above. It is user driven wireless standard for the industry and enables a cost effective network that is able to support everything from monitoring to simple control become a reality. ISA100.11a has become an ideal wireless communication choice for industrial applications because it was designed with a self-organizing and self-healing capability coupled with a flexible mesh and/or star network topology to ensure flexibility and optimize power consumption, along with the multiple communication hopping technologies to ensure the reliability and determinism of communication. The wireless radio technology is changing over time; it requires the wireless network to decouple its network layer from the physical media in order to be flexible adapting to the new radio technology. The ISA100.11a wireless standard has been designed with this concept in mind. With a single wireless network infrastructure, ISA100.11a is able to handle multifunctional sub-networks using the backbone infrastructure, which can support a large amount of sensor deployments. Additionally, it is easy to accommodate a variety of sensors for the entire plant's needs and to integrate the wireless network into existing wired network infrastructures to protect the existing investments. Based on those considerations, a large refinery selected Yokogawa's ISA100.11a wireless solution for a field test. The objective was to monitor the pressures and temperatures remotely from multiple measuring points around the refinery. This particular refinery covers a very large geographic area. In the existing system, the pressure and thermal gauges are off-line with no communication to the control center. Every day, a human patrol was sent out to the refinery to read the measurements from each gauge and then report the results to the control center by phone. In this project, the wireless pressure transmitters replaced the traditional pressure gauges, and wireless temperature transmitters replaced the traditional temperate gauges for a real-time monitoring. At the initial field test, eight transmitters were been used for monitoring different measuring points. Two repeaters were used to cover four transmitters at each side of the refinery. Each repeater was installed in a tower which was over 40 meters high to avoid large obstacles in refinery. The repeater was used to communicate online with the gateway in order to cover the long distance. One gateway was installed on the roof top of the control room. 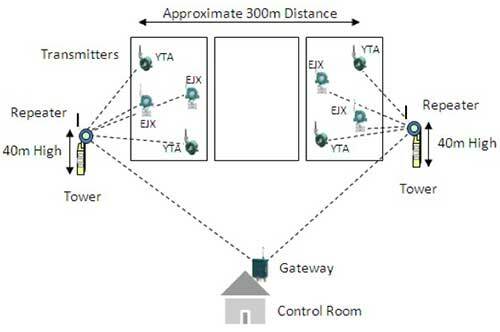 The distance between the gateway and transmitter was approximated 300 meters. Figure 1 illustrates the wireless configuration of this project in the refinery for pressure and temperature monitoring. The result has been a very high quality and robust wireless communication which has achieved the initial goals of the project. Figure 1 illustrates the wireless configuration of this project in the refinery for Pressure and Temperature monitoring. The ISA100.11a standard based wireless network has been trialed in a large refinery. The wireless technology has successfully eliminated the restriction of traditional pressure and thermal gauges which required a manual reading operation and replaced it with a real-time remote acquisition of the pressure and temperature data using ISA100.11a based wireless pressure and temperature transmitters. Also, a very high quality of wireless communication with lower packet error rate has been confirmed to show the robustness of the ISA100.11a wireless communications. The wireless technology has brought great benefits to the plant including increased day-to-day operation efficiency; limited human errors and the monitoring of the plant in real time. This will result in enhanced plant safety by automating the monitoring and reading process. Dr. Penny Chen is a Principal Systems Architect at Yokogawa Industry Automation Global Strategic Technology Marketing Center in US (USMK). She is responsible for technology standardization and marketing strategy focusing on wireless, networking and related security. Penny is actively involving in ISA100 (Wireless Systems for Automation), ISA Wireless Compliance Institute (WCI), and Wireless Industrial Network Alliance (WINA). She is currently the Vice-Chairman of WCI, Co-Chair of the ISA100.15 Wireless Backhaul Backbone Network Working Group, a Board Member of WINA. Over the past thirteen years, Penny focused on wireless networking technologies and security solutions for a variety of wireless technologies include Bluetooth, Wi-Fi, and 2G/2.5G/3G Mobile technologies. Penny received a Ph.D. in Electrical Engineering from Northwestern University. She can be reached at penny.chen@us.yokogawa.com.